I am light. My body is light. I am free. I know my fulfillment: I feel it rise within me, expand out from me. Welcome to day 40! How did you do? Were you consistent daily? Did you contemplate your ideal (or the Guiding Thought) for at least 5 minutes per day? Did you dig deep, expand your self-knowledge, and learn about how you approach life? Whew. That’s a lot to do and expect of yourself. If you did anything at all toward self-awareness, and learning about how you choose to live life…give yourself a hug, or at least a pat on the back. You’ve done some good work. Now it’s time to take a break. Breathe for a few days, normalize a bit, then take some time to read back over what you have written over the past 40 days, and reflect on where you were, where you are, and what you think you learned over the course of this Journey. I’ll do the same. But now…day 40! Just in the past two weeks, I’ve been trying some new things to increase my inner-light-awareness. I have always wanted to be light. I used to–and I suppose I still do–draw myself with so much inner light that it radiates outward everywhere. I used to feel the light bubble up within me, and flow out my eyes and hands. I’ve always believed somewhere deep down, that I am light. Of course, I’ve had to reconcile this with my experience of being a dense, 3rd-dimensional, material body/person…which is what I live with day after day after day… yet for some reason, I still think I am light. I think some how, some way, I can be light, not this heavy, dense, material body. So today’s Guiding Thought has special significance for me–I’ve been working at this since I was a teenager! I am not daunted that I haven’t figured it out yet. I will. We all will, sooner or later. I just keep working at it and trying stuff. So in the past two weeks, I’ve started taking a fish oil that is high in anti-oxidants, which is supposed to cleanse (de-calcify) the pineal gland. There are those who believe the pineal gland is the seat of the third-eye, the spiritual eye. It is the seat of true vision, manifestation, and higher communication. Apparently, things like chlorine, fluoride, and bromine calicify the pineal gland and inhibit its proper function. So I’m trying it out. It’s only been a few days, and I have nothing to report, but if all goes well, my third eye will open and I will be that much closer to giving/receiving light! Secondly, I’ve been carrying around crystals. 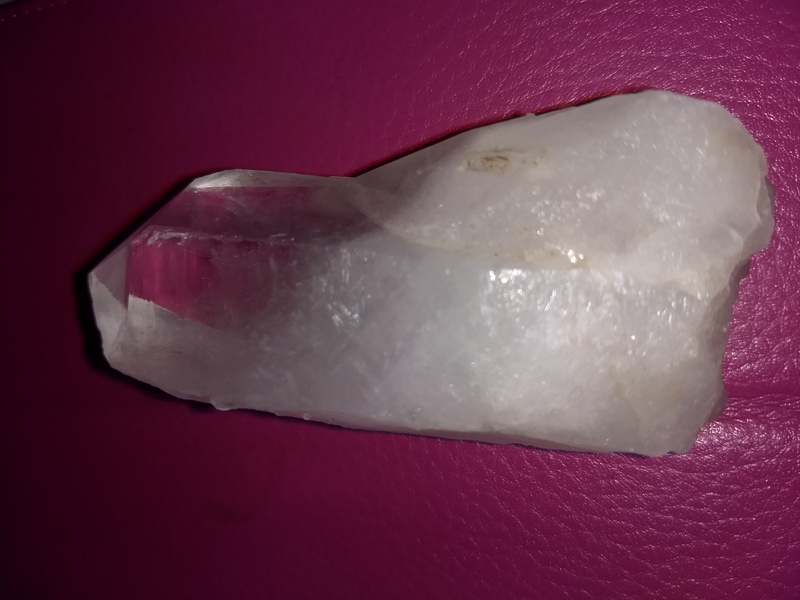 I have this beautiful quartz crystal that fits across the palm of my hand (about 4″ x 1.5-2″)–and I can wrap my fingers around it…So I’ve been carrying it, sleeping with it. This behavior is not completely new; I’ve had this crystal for over two decades, and it accompanies me during certain times in my life. Finally, I’ve been sleeping with music which entrains the mind with delta brainwaves. That’s “just” a sleep entrainment, nothing fancy–no binaural beats or subliminal affirmations, but since cleaning the pineal gland is supposed to open the vision/dreaming faculty, I figure better sleep won’t hurt. All of this is to continue progressing upward. Call it frequency, call it sound, call it light, call it vibration, call it consciousness, call it what you will. It’s about embodying more and more energy, love, and light. Being able to handle it and then radiate it. Today, I just finished reading The Law of One, by Ra, a humble messenger of the Law of One, Book I. After reading this book, I recognize that concepts like today’s Guiding Thought are not going to appeal to many people–the ideas are nice in theory, but hard in practice to many. Very few people, apparently are oriented toward service to others; more people are oriented toward service to self (as in their individual self), and “giving peace, no matter what” is not an easy or a natural extension of service to self. My mind has really opened to the many, various paths that people are on, after reading this book. Prior to reading the Ra Material, I now recognize that I thought there were “better” or “higher” paths–and that ideas such as those contained in the Guiding Thoughts represent those “better” or “higher” paths. But now… I am re-thinking, reconsidering, re-working, integrating new ideas and concepts. Expansion and growth, now that’s what the Journey is about–finding unexpected surprises and integrating those understandings into a greater/deeper understanding of the variety of life-experiences. Let me be clear: This does not mean that I would necessarily integrate ideas or concepts into my own “identity”, or accept the energy or vibration for myself, but it does mean that I am more accepting (non-judgmental) of others who might think/feel/behave differently than I would on my path. There is only one law: the law of One. This is not a difficult concept for me; I’ve been working with this idea for several years now. “I am not the ocean, but the ocean and I are one”. We are all not the ocean, yet one with the ocean. This is a hard concept for a lot of people. One way to warm up to it, is to let your mind wander into the ideas of infinity and eternity. Just muse about those concepts on a daily basis, they will plant seeds to help in accepting the law of One. We all serve God, regardless… Everyone serves God. Period. There are two orientations that people can take to serve God: Service to self (as in the individual self) or Service to other (as in other people, what could be called “humanitarian” in the most expansive sense). Although we choose which orientation we want, we do so consciously only after we have been in the habit or behavior of it for some time. Because we have free will, we can always switch our orientation. These two orientations balance each other. Service to self is known as the “negative” orientation; service to others is known as “positive” orientation. These are not value-judgments of “good” or “bad”, because everyone serves God regardless of which orientation they choose. Service to self seeks God because service to self is service to All. Service to self uses manipulation, control and power to seek God. Service to others seeks God, through service to others and uses love, understanding and compassion. This orientation increases the learning/growth exponentially because rather than a 1 to 1 relationship (as with service to self, which only serves self), there is a 1 to many relationship, which spreads out like roots or branches, to all those served. There are far fewer people currently on the planet who are oriented toward service to others. Both paths are difficult–and we humans have been through so much in our history, dampening our consciousness of seeking God. We are all serving God. This may be hard to swallow, especially with all of the social-political-ideological disagreements going on these days. But what if you could view everyone as serving God? What if you knew in your heart that regardless of external polarities and disagreements, that everything and everyone is unified in God? God is with us. God is paying attention. God wants us to seek him, and wants us to realize our oneness with him/her. S/He has not abandoned us–we are all serving the One Infinite Creator. Know yourself. Be yourself. Walk your path. Be aware! Understand your choices. Choose consciously. Whatever you do, whoever you are, dig deep into yourself and be yourself. Be authentic. Follow your heart. Don’t worry, there is no wrong…just learn, and seek, and learn, and seek. Any wavering in motivation or intention potentially opens you up to influences to persuade you (or manipulate you) in a direction that you may or may not want. If you are not clear about the direction you are headed, you are susceptible to being lead down anyone’s path. It is so important for you to know yourself. What do you want, really want? Do you have material goals or spiritual goals? Do you want to serve yourself or serve others? Do you care about your own progress, your own evolution? What direction are you going? What are you doing to go in that direction? If you do not decide these things for yourself, so that you know in your heart what is right for you, then how do you know if you are on your path, or on a path that someone else is suggesting for you? There is no “right” path. There is no “wrong” path. You do not need to be altruistic, dedicating yourself in service to humanity. You do not need to be a saint or a buddha. You do not need to have no bad habits, no vices. But it is becoming very important for you to become aware of who you are, as a person. What motivates you? What are your core intentions? What direction are you heading, what direction do you want to head? Where do you find peace? Where do you find Joy? Where do you invest your time? Do you care about other people? Do you care about the world we live in? Who are you as you walk through this life? This life is here for you to learn and grow and go as far as you can within this personality that you have the opportunity to experience. Why should you know yourself? Because life is more fun when you understand who you are, how you interact in the world, and live consciously, making choices that benefit you and your path. You are the most important person in your life. Be a person you love, and would love to be around. My joy unifies! Accepting my own joy—acknowledging it, sharing it, and expressing it—heals myself and others. To be wholly joyful means to be wholly love…means to be wholly my Self. Love is always–eternally–the first principle, the first action/movement, of Divine Source. Everything thus flows out of Source and Love. can be traced back to Love and Source. Everything can be traced back to Love and Source. This is what is meant by Oneness. Everything originates in Source, through Love. Everything serves Source and Love. Everything returns to Source and Love. Everything is unified in Source and Love. We are One in Love. This is the next phase of our (humanity’s) self-awareness. We became self-aware, and began to ask “who am I”, “where did I come from”. We looked to the stars, to nature, to science, to religion. to looking for answers through our own connection with Source and Love–looking to the Truth for answers, where we may find true answers. This is our evolution, to become self-aware of our Oneness with Source, with Love, with each other. The 2017 Saturn return was significant, because Saturn entered its home sign of Capricorn. This Saturn-Capricorn combination emphasizes work To Saturn in Capricorn, the work is the reward. Self-respect is the reward. Mastery is the reward. ” In short, Saturn in Capricorn is about reaping the rewards of hard work–relentless, ambitions, determined hard work. When I read today’s Guiding Thought, I was thrown into an energetic deja vu about how intensely I felt the Saturn return last December. At that time, I was feeling ready to take the next step in my real (purposeful) work, ready to forge ahead, brave the elements, stick my neck out, and accomplish everything I could dream. It’s been a long year. I have not accomplished as much as my ambition had hoped a year ago (but, really, I still have two months before the anniversary of the beginning of the Saturn return). Yet, I have accomplished more than I had even thought regarding my higher Self’s vision for my accomplishments. My ambition expected me to be “out there” marketing my wares, setting up income streams, wheeling and dealing, forging networks, posting tons on social media. My higher Self provided me very intense training, to strengthen my relationship with God, to gain confidence in my own faith, to be at ease with my spiritual expression, to desire more spiritual growth. It was as though I had (still have to?) get through some layers of learning before I could advance. Am I through those layers? I don’t know. But I can tell you that I felt energized and motivated to work, to thrive, to accomplish even more with the union of my Spiritual Self and my worldly self as I read today’s Guiding Thought. I frequent my local Trader Joe’s. I’m there once a week, at least, and I have met people over the past four years who I would say are friends. Trader Joe’s seems to me to magnetize fascinating people, as workers. They are people who “do other stuff”, but also happen to work at Trader Joe’s. When Geoffrey Owens was shamefully shamed about working at TJ’s, I thought, “Man, people just don’t understand the TJ’s vibe”. TJ employees–at least the ones I have gotten to know– are people who are totally identified with something more than their J-O-B. They have other things that they do, that they LOVE, that are supported and nurtured through the income they receive from TJ’s. One of my TJ’s friends moved here from another country to start a church with his wife and children–and that church is thriving. Another friend does Reiki, teaches cooking classes, and is a personal chef. Another one survived cancer. Another is an actor who had a syndicated series, made several appearances on West Wing, and guest starred on Star Trek: Deep Space 9. These are well-rounded people doing things with their lives. Amazing amazing people. The friend I spoke with today, though…he’s the reason I’m talking about Trader Joe’s. And today I got a whole new perspective from this wonderful Nigerian man. Noo. Noo. This job could not sap the life out of me (try hearing this with a Nigerian accent). You do not know what I have been through. You do not know what I have seen. For 14-15 years I have seen… from just a child. I was in a line, like this, my mom, my brothers, all in line for interrogation. there were 2 doors. After 5 minutes in interrogation you go out one door, you are shot right there, the other door you go. You don’t know which door…there was a man ahead of me in line. Alive one minute. Dead the next…. I jumped on a boat to get away. That’s all you can do, get away. They would not let us on the boat, they refused. We were all standing there, and just over there (he points about 200 feet away, across the parking lot), there was the war, fighting, coming closer. The man next to me, standing with his boy on his shoulders, we are all trying to get on the boat and >ping< he is shot. Then >ping< >ping< >ping< people around me are getting shot. I jumped on the boat. [this boat he’s talking about became infamous…read about it here: Ghana Refuses to Take In a Boatload of Liberian Refugees. You keep moving. You go away. That is all you can do. All these things they make us stronger. We Nigerians, we strive. We get stronger. I believe in God. I could have joined the rebellion and killed innocent people, but I just kept moving, kept getting away. The war would follow…once my neighbor was killed in the middle of the night for no reason, we left the next day. You just keep moving, you strive, you keep going. You get stronger. My Self wills only to extend itself. Extending, sharing, and creating as Divine Love, through Divine Mind, is my sole (soul) purpose. My Self knows its fullness in Divine Love and wills only to liberate me to fulfill my purpose and my joy. whether or not we think what we do is a Divine expression. There’s a bit of chaos in the world just now, don’t you think? or to simply speak, quietly, courageously. Perhaps we are experiencing advanced nihilism. Nothing matters. Everything is relative. Who cares? But perhaps we are experiencing an explosion of Divine expression. Nothing matters. Everything, down to the smallest bit of nothing matters. Which means of course that everything matters. every wrinkle, every dip or bend or twist matters. Everything is that Divine Expression. Do you trust God to express through you? I do. Live your truth.